For centuries it was suspected that there must be an undiscovered continent in the southern hemisphere. But explorers failed to find one. On his second voyage to the Pacific, Captain Cook sailed further south than any of his rivals but still failed to sight land. He had to be content with claiming sub-Antarctic islands for England's King George. It was not until 1820 that the continent's frozen coast was finally sighted. Territorial rivalry intensified in the 1840s when British, American, and French expeditions sailed south to chart further portions of the continent that had come to be called Antarctica. For the nearly two centuries since, the race to claim exclusive possession of Antarctica has gripped the imagination of the world. 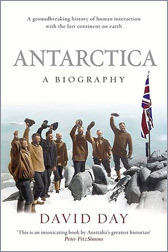 Antarctica: A Biography is the first ever major international history of this forbidding continent - from the eighteenth century voyages of discovery to the fierce rivalries of today, as governments, scientists, environmentalists, and oil companies compete for control. On one level it is the story of explorers battling the elements in the most hostile place on earth as they strive for personal triumph, commercial gain, and national glory. On a deeper level, it is the story of nations seeking to incorporate the Antarctic into their own national stories - and to claim its frozen wastes as their own.